USS Westfield belonged to an unusual class of civilian vessels that the Navy converted during the American Civil War to serve in the Union's blockade of Confederate southern ports. Originally built and operated as a double-ended ferryboat, the vessel was purchased by the Navy from the New York Staten Island ferry service. Westfield served as the flagship for the West Gulf Blockading Squadron's operations along the Texas Gulf Coast. 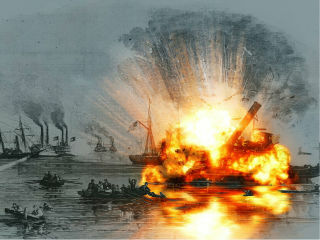 The vessel last saw action in 1863 at the Battle of Galveston where it ran aground and was blown up by its crew to keep the vessel out of Confederate hands. In 2009, the U.S. Army Corps of Engineers (USACE) orchestrated Westfield's recovery in advance of their operations to deepen the Texas City Channel. Archaeologists recovered approximately 8,000 artifacts during the salvage operation including a 9" smoothbore Dahlgren cannon. The USACE sent these artifacts to the Conservation Research Laboratory at Texas A&M University where the artifacts underwent conservation and study. In May 2014, the Houston Maritime Museum hosted a presentation on the Westfield during the conservation phase of the project. Now complete, this follow up presentation will describe the seven year project and how numerous components of the vessel were physically reconstructed and placed on permanent display at the Texas City Museum.